When I saw A Woman's Wisdom : How the Book of Proverbs Speaks to Everything pop up on Crossway Books' new release list, I knew I'd want to read it. (If it's from Crossway, I generally want to read it. And wisdom isn't generally something I purposefully try to avoid receiving. For the most part anyway.) Having read one other book by Brownback before, I knew her style had great appeal and so I was in a good position to really like this book. I did more than liked A Woman's Wisdom - I loved it, although for somewhat painful reasons. And so I'm going to do something with this book that I've threatened to do with others. I'm going to talk about it all of this week. I didn't want to do all of the talking though and so I asked for a couple of other friends and bloggers share their insights and opinions on this book as well. It should not for one second be believed that we are addressing the subjects which this book talks about because we feel we are superior or in a place to give instruction without receiving any. We aren't perfect and do not in any way pretend to be. (If you know us well, you must know this to be true!) We are only talking about these subjects because we feel that someone ought to; because we don't hear these subjects being addressed very much and/or because we feel passionately about them. It is, however, completely understood that we are very much in need of wisdom ourselves. The only thing we hope to impress upon ourselves in writing what we do is the need to pursue wisdom and apply it as accurately as possible. We invite and encourage you along the journey. 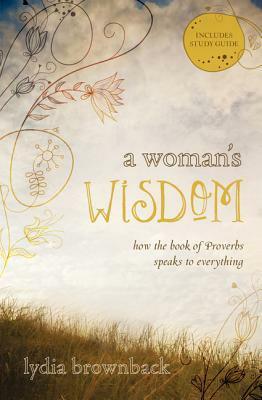 As an overview, this book is a study of the Book of Proverbs as specifically applied to women. From the very beginning, Brownback admonishes and encourages her readers to hate sin and pursue righteousness. Only by learning to hate sin can we truly grow in wisdom. In today's day and age we tend to think of "sin" as a bad word. It's harsh to declare that someone is sinning or "is living in sin", no matter what the truth may be. We either don't want to hurt someone's feelings, or we dislike conflict, and so we glance over bad behavior and poor communications so that a general sense of temporary happiness can be maintained. These days we're afraid to say that something is or could be wrong. We like feeling happy; we deserve to be happy. We choose ignorance in order to pursue temporary pleasures. Ignorance does not foster anyone's growth in wisdom. Frequently a growth spurt in wisdom requires a certain amount of pain - which is why we try to avoid it. Deciding that you will pursue wisdom, no matter what the cost, is not an easy decision to make but it offers you the most promise because the pursuit of it will bring you life. So what is our goal in discussing this book? It is merely to promote thoughtful conversation and self-evaluation, (in ourselves, by the way), comparing our own thoughts and behaviors to scripture. We long to cultivate humility by ceasing to naval gaze and to see what God has to say about the way that we speak, build and maintain friendships and generally go about living our lives. We hope you will journey with us. I am really looking forward to the discussion...I gain lots from your detailed thoughts. And yes...would love my own copy. This is incredibly generous of Crossway. Very excited about this series. This book looks fantastic! I have some of her other devotionals on my Kindle (Contentment, Trust) and enjoy her writing, so I know this book will be in my collection before too long. And wisdom...yes, always a good thing! Yes! Sign me up. I've been wanting to read her books and this looks like the perfect place to start. I will be here everyday! Thanks Carrie! That name sounds familiar -- I think I have one of her devotionals but haven't read it yet. I'd love t win a copy -- we could all use more wisdom. I think it is so painful to gain because we first have to realize that whatever we were thinking or doing was wrong, so it is a blow to the pride. Plus there's the whole inertia thing, it being easier to stay with the status quo than change something. But it is necessary to growth. Sign me up for the giveaway! I look forward to the rest of the posts. Ooo pick me! I have heard great things about this book! Yes, sounds like a great book! Please enter me! The book sounds interesting. Thanks for having this giveaway. crossways is a very reliable source for the goods! I could use some wisdom! I love Proverbs and would love to check this out! I think I am going to have to add this book to my list of books to read, it sounds like a great read! Thank you for sharing your thoughts! Can always use a book on wisdom! Who doesn't need it? I could really use the wisdom in this book. I would love to read this book! Looking forward to checking it out at the library I I don't win the drawing! I would love a chance to read this book! Thanks. This sounds like a great book! I would love to win a copy.